First, thank you ALL for the congratulations and well wishes! I couldn’t respond to every message as they flooded in on text, Facebook, Twitter, blog, Instagram, email….but I tried my best. I’m still in foggy haze of bliss and glow from the engagement and haven’t given much else any thought! What followed was probably the most epic, awesome, gut-splitting hilarious thread I’ve ever had on Facebook. Everyone chimed in. Of course, a bunch of my friends and family are nerds and were totally on board with this idea, fully supporting Michael. It went downhill fast. There were suggestions of The Dark Crystal theme, Game of Thrones, Lord of the Rings and The Mists of Avalon (which I can actually get behind) and then went into deep discussion about our reception being the scene in Tatooine (whatever that means), with me in a gold bikini, my dad dressed at Darth Vader with me on a leash (what?!) and a friend asked if he could dress as a Sand Person. Is this what wedding planning is like?!!? I guess everyone wants to give their input…The Facebook thread went on for hours with so many people giving their hilarious two cents. But rest assured, we won’t be having a themed wedding. Sorry! Seriously, though, Michael and I spent a good two hours looking at websites and narrowed our venue list down to 6 places to check out. The awesome thing is that we both agreed what our #1 place is! We’re going to look at that place last. One of the first questions we both get from people who hear the news is “have you set a date”? In all honesty we haven’t set a date but we narrowed it down to a season. We didn’t really agree at first. I wanted a winter wedding (off season, cheaper, not as far away) and Michael wanted a summer wedding (nice weather, possibly outside). The more we talked about it, the more we both kind of compromised with September 2014. But that’s still up for debate! So far everyone has been really awesome about our news and offering to help plan. I appreciate the enthusiasm and support! I signed up for The Knot website but immediately regretted it. The website was really overwhelming and felt like it was a vortex that creates bridezilla tendencies–something I am going to try my hardest to avoid! I think I’m skipping The Knot and going with an iPhone app and making my own lists. The problem is, where do you start? While Michael and I have talked about weddings for years and have planned little bits and pieces of the whole thing, knowing where to start is really overwhelming. I got home from work yesterday to a mysterious package! Inside was a massive wedding planning book courtesy of my friend Rachel. It was awesome and such a sweet, thoughtful gift! I hadn’t even had time to think about that kind of stuff. I’ve never seen a ring like this before and I love how unique it is. 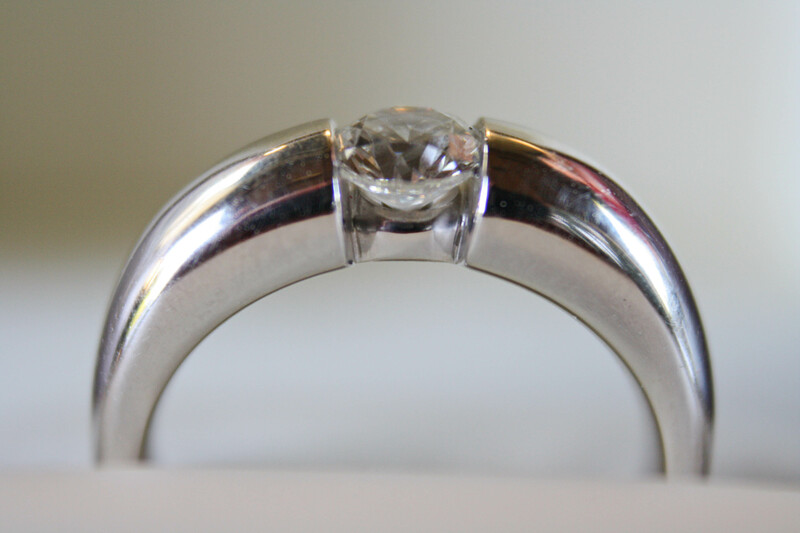 It’s white gold and it’s a tension setting, which means there aren’t any prongs (which is nice). It’s smooth and the diamond is flush with the band so it doesn’t get caught on anything. This will probably be the last wedding post for awhile. The next step is setting a budget, finding a venue, picking an actual date and we’re going to take our time doing that. We also have some family trips and a vacation coming up so that will take up all of our weekends for awhile. I think I’ll do a post in about a month or so when we start looking at venues. If you’re in Portland and have a recommendation for a venue, please tell me! Just take it one piece at a time. It’s really not that hard (but I should shut up since I have an events background) but there will be weird things that fall through the cracks (mostly right after the wedding – we left our parents at the venue with no transportation back to their hotel. Oops. Then we didn’t have enough room in our car to pick up the décor from the venue the next day. Again, oops. ), but get through the big things first. Look at Rylee, she’s putting together her wedding in two months! I’m sure there will be lots of things that don’t go quite perfectly. That’s going to be the hard part for me, letting things go and not getting upset if there’s something that isn’t “perfect”. Rylee is amazing! 2 months! I was impressed when I heard that! I love love love Edgefield! A lot of the McMenamin’s locations are REALLY nice! Continued good wishes to your both during this exciting time!!! I think September is nice because it will (hopefully) still be nice weather but not too hot. Ha, I saw your FB post but I’m slow and didn’t realize that was the big news! I just figured you guys had been talking about it a while. The ring is beautiful, congrats!! Oh we’ve talked about it for years! Thanks! I love the ring. Oh P.S. I got married in September too! What beer did you have on tap at your wedding?? I love your ring. It’s perfect for your active lifestyle. Back when I was planning our wedding I liked Wedding Bee. A good forum and an interesting range of bride bloggers who post as they plan their weddings and beyond. Not as high stress as The Knot. Yes, Michael made a good choice. Now I don’t have to take it on and off all the time to work out. Thanks for the recommendation, I’ll check out Wedding Bee. Congratulations!! I love that ring! Wedding planning can consume you — try to keep focused on what really matters (each other). I’m trying not to be consumed! The knot is great for ideas, but take everything with a grain of salt. You don’t need half the stuff they say you do. 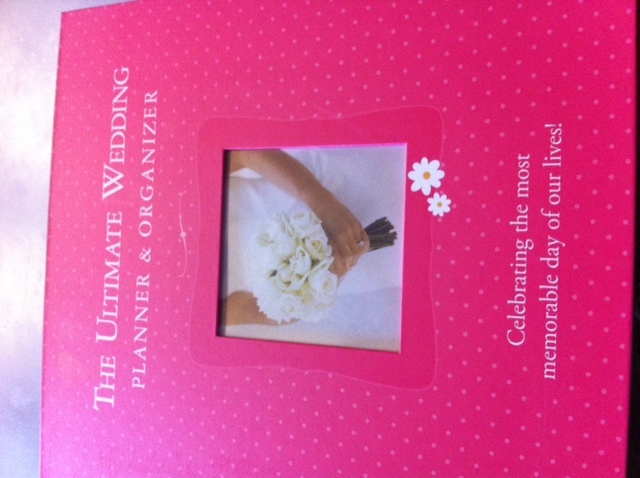 Weddings are money makers, and there is a lot of stuff that people say you need when you don’t! Happy planning! My advice is to go with your gut and trust your first instinct. You usually go back to the thing you liked the most anyway! I planned my whole wedding in 3 weeks because I’m not one to ponder situations, I just went with my gut. Also, don’t sweat the small stuff. No one remembers your shoes or your table decorations. They remember a lovely ceremony, great food and drink, and a good time. Focus on the big picture and you’ll be fine. Thanks for the tips. I agree. I think things will just kind of fall into place as we go along. We got married September 6 – it is a great time of year for a wedding. You will have a wonderful day! Focus on what’s really important to you – if flowers or favors are not a big deal to you then don’t go crazy on them! We had amazing food at our wedding (sea bass for entree) – 15 years later people are still talking about it to us! Food was important to us – I’m sure to you also. The food is definitely an important part. I’m so excited for you! We’re getting married the end of May and it’s so overwhelming for me that I’m on the serious SLOW track. Ali @ Peaches and Football recently posted..The First Results! So far it’s pretty fun. Congrats on your engagement! I’ve never been one of those girls that thought about their wedding growing up – I just knew I’d get married someday, never thought about the details! I met and married my husband within six months – my MIL planned almost everything – we got married on a beach in Naples, FL – my daughter was maid of honor, my step-son was best man, then just my Mom and my parents in law – it was perfect! People thought we acted too fast, but we knew within a month that we were meant for each other. We’ll be married 13 years in December! That sounds wonderful and simple! Less stress! Nah, I think when you know you know.